Kathryn Bigelow’s “The Hurt Locker” lead the winners of the the Orange British Academy Film Awards, or BAFTAs, handed out at London’s Royal Opera House tonight. The film took honors for best picture, director, original screenplay, editing, cinematography and sound – well ahead of James Cameron’s “Avatar” and Lone Scherfig’s “An Education,” which had lead the nominations along with “Locker”. Another female-helmed film – Andrea Arnold’s “Fish Tank” – took the night’s biggest Brit-centric prize, topping “An Education,” “Moon,” “Nowhere Boy” and “In The Loop” for the Best British Film award. 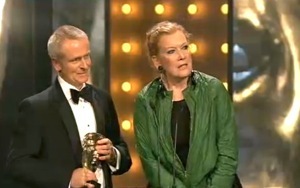 Andrea Arnold (right) accepting the BAFTA award for Best British Film. Jacques Audiard’s “A Prophet” beat out Michael Haneke’s “The White Ribbon” for the “Best Film Not in the English Language” prize. Audiard made a lively speech that brought down the house. 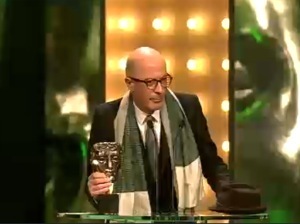 Jacques Audiard at the BAFTAs tonight in London. Meanwhile, “Precious”‘s Mo’Nique and “Inglourious Basterds”‘s Christoph Waltz continued their dominance of the supporting acting categories this season. 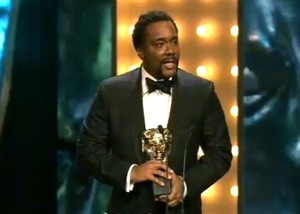 Lee Daniels accepting the best supporting actress BAFTA for Mo’Nique. Mulligan followed Firth, and humbly announced her surprise in winning, and her envy in Firth’s speech giving. James Cameron, who saw his “Titanic” lose every single award it was nominated for at the BAFTAs, at least can already say that wasn’t the case with “Avatar.” So far, it has taken both the production design and visual effects awards (“Titanic” lost those BAFTAs to “Romeo+Juliet” and “The Fifth Element,” respectively). Also of note regarding the ceremony was the announcement that Prince William would succeed Richard Attenborough as BAFTA’s fifth president. Read more on that story here.